A standard Silver or Gold Magni equipped with a Raspberry Pi 3 with a Ubiquity Robotics SD card image is by default set up to work with a Logitech gamepad Controller out of the box without bothering to connect via laptop over a network. In particular the robot is tested to work with the logitech F710 controller that is widely available. It may work with other similar logitech gamepads although these are not officially supported. If you have such a controller plug the dongle in to any USB port on the Raspberry Pi 3 that is attached to the front of the robot. If you booted up with a Ubiquity Robotics RPi image, and have the Logitech controller USB dongle installed, the joystick should start to work in a couple of minutes. The Dongle is automatically paired to the Logitech controller it does not require separate software installation. You can test this by using the Joystick and seeing if the robot responds to commands. For safety sake, raise the robot’s wheels above the floor first. (SAFETY TIP). If the wheels don’t move, check the troubleshooting section further below. 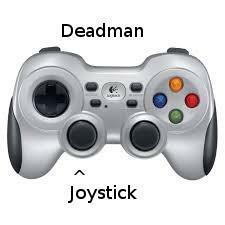 To operate the controller, hold down the deadman button (LB) and move the joystick. The controller is set to be very slow. You can increase the speed by using the (LT) button below the deadman, this will increase the maximum speed by about 25%. Moving the joytick to a position between full up and full right will move the robot in a curved path. If nothing happens, you’ll need to go back to the unboxing section and check to see if the robot is gettting power, the MCB is working and you can connect to the robot via a network (see connecting to your robot for the first time.) Check to see that your dongle is installed in the Raspberry Pi, there are fresh batteries in the Logitech Controller, and there is power going to both the Raspberry Pi and the motors. If the LEDs and the power switched are lit, you can additionally test to see if the wheels resist being turned. the robot responds by giving you its IP number. Type Control-C to kill off the ping command. You may get asked to authorize your key, say yes. 0 package can be updated. If you see /joy you are good to go! Shows everything is running. You now should be able use the controller to drive the robot. scale_linear This value controls the maximum velocity the joystick will control for maximum forward or reverse joystick movement. scale_angular This value controls the maximum turning rate in radians per second. Some users lower this for slower turning when the joystick is pushed all the way right or left.